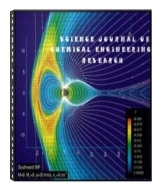 Science Journal of Chemical Engineering Research ISSN:2276-509 is a broad based journal covering all peer-reviewed international journal of chemistry covering all aspects of chemical engineering.The journal aims to provide an international forum for the presentation of original and fundamental research, interpretative reviews and discussion of new developments in chemical engineering.The Journal publishes full-length research articles dealing with completed research projects on subjects such as experimentation (both techniques and data) and theoretical models. Review papers reporting on the current state of of chemical engineering are also welcome, as well as short communications and letters. Studies were carried out on the transesterification, also called methanolysis, of oil from the Jatropha curcas L. with methanol using conventional heating for the production of biodiesel. All reactions were carried out in a batch-stirred reactor and in the subsequent separation and purification stages. The high free-fatty acid (FFA) level of Jatropha oil was reduced to less than 1% by a two-step process. The first step was carried out with 12% w/w methanol-to-oil ratio in the presence of 1% w/w HCl as acid catalyst in a 2h reaction at 343K. The second step was carried out with variable parameters: temperatures at 318K and 333K, initial catalyst concentrations at 0.5% and 1.5%, methanol:oil molar ratios at 4:1 and 6:1, and reaction times at 1h and 2h. Gas chromatography analysis was used to determine the fatty acid profile of crude Jatropha oil. Methanolysis of Jatropha oil used the catalysts NaOH and KOH. The high FFA level of Jatropha oil was reduced from 6.1% to 0.7% after the first step process. The highest yield of fatty acid methyl esters (FAME), however, was achieved at 92.7% in 2h at 4:1 methanol:oil molar ratio, 1.5% w/w KOH, and 333K reaction temperature. This method produced biodiesel that met ASTM’s biodiesel standards. Results showed a density of 0.8g/ml that is within 0.86–0.9kg/l standard range and a kinematic viscosity of about 4.1cSt that is within 2–4.5cSt standard range. The flash point of the biodiesel samples fell between 169oC and 179oC while the cloud point averaged at 6oC. � 2011 Science Journal Publication.